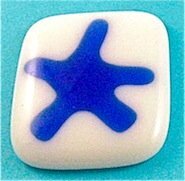 Creating fused glass decorations to add to kiln fused jewelry and general fusing projects. Decorations can be made from small pieces and kiln fired to produce unlimited shapes and sizes. In this projects strips are cut and then fired in a fusing kiln to produce an abstract shape which can be added to a suitable base. It is possible to fully fuse these shapes into the base as can be seen from the following photo. The number of strips, color and size can be altered in many different ways to make these items. This project is for a jewelry piece but can be fused to make large decorations for general fusing projects. The object is bought up to normal fusing temperature very quickly. Because it is only one thickness it will pull in and change shape as it tries to reach its normal thickness of about one quarter of an inch. Changes in shape will also occur if the strips are cut at different angles and lengths. It is important when fusing these decorations that the fusing kiln does not over heat as the glass will distort very easily. The next photo shows the decoration at the completion of the fusing cycle. It has altered shape and size and is now ready to be used as a decorative item. At this point it may be tack fused, contour fused or fully fused in to the base layer. 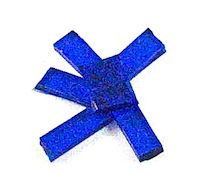 It is important that the fused item has retained a nice shape suitable for the next fusing stage. Monitor the next fusing stage to ensure that even fusing occurs. As per the photo, the deoration has been placed on top of two bottom layers and has been contoured fused so that it retains most of its shape. Using these techniques many different items can be designed. Dichroic pieces can be included to give the finished piece a special finish. System 96 has been used for this project. Bullseye glass can also be used.